The non-contact voltage detector BE16 belongs in the basic tool kit of every craftsman and do-it-yourselfer. For the convenient measuring device detects voltage sources of only 5 V ranging up to 1,000 V or 50 Hz to 400 Hz quickly and reliably. Located at the side of the voltage detector is a thumbwheel allowing the stepless regulation of the sensitivity level. In advance you can finely adjust the measuring range to the voltage values to be expected. It is perfectly suited for finding a cable break or determining the presence of alternating voltage in fuses, open wires, cable drums, jacks, sockets, switches and cables concealed in the wall. Owing to the capacitive measurement method, approaching the conductor with the voltage detector suffices – without any contact – and the BE16 will warn you quickly by means of a flashing red LED illuminating the entire detector tip. An acoustic warning signal is also emitted in addition. 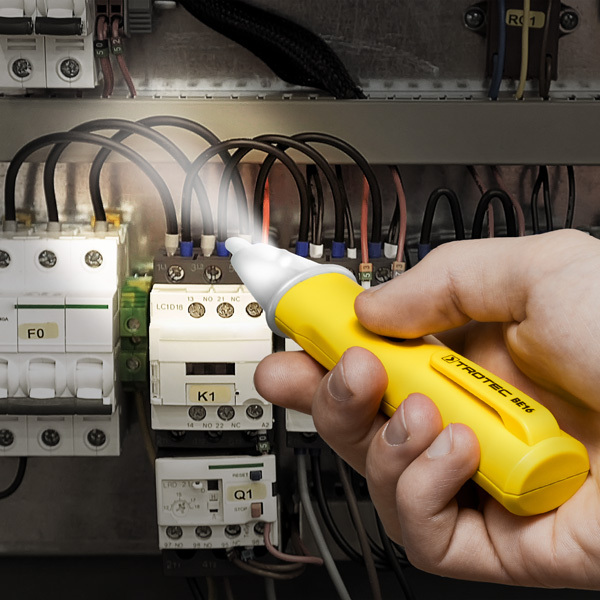 The compact, pen-shaped voltage detector comes equipped with an on-demand LED lamp integrated in the measuring head; it permits the safe and precise operation even in poor lighting conditions. Clipped onto shirt, jacket or trouser pocket – the compact and reliable testing instrument BE16 is always close at hand for quick voltage detection applications. Dark measuring areas can be optimally illuminated with the integrated LED torch of the BE16. The successful detection of a voltage field is indicated by the BE16 with both a beep and red flashing.